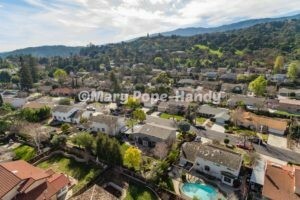 How is the real estate appreciation in our idyllic part of east Los Gatos, known locally as the Surmont, Belgatos area or Belwood of Los Gatos neighborhoods? Since turnover is very low, inventory is always restricted and the demand tends to be strong. Recently I did a breakdown of the sales history of the last 5 years here (see the page under “homes info” on Belwood, Belgatos and Surmont sales history info on this site – link at the bottom of the homes info page or use the inserted link, above). Appreciation here is steady. (3) It appears that homes in this area near Belgatos Park have nearly doubled in value since 1999 (the year we bought our home). That ratio depends, of course, on some updating being done (so the home isn’t effectively “older” than it was in 1999) and can vary depending on the house. But as a rule of thumb, most properties here have almost doubled since 1999. This is true of most of Los Gatos. This is a great part of Los Gatos for many reasons, finacial ones included!